Matt, That corner is getting awfully crowded ... I’m lurking there right along with you! Meanwhile, Nick's corner is looking very lively ... especially in daylight! An addition to the suggestion pool … how about adding a shopping cart filled with personal belongings? OK, anybody know of a company that makes a brass etch grocery shopping cart in 1/35th??? Alright I get it. Mike already answered my question. I did not notice the hot link to Royal Model the manufacture of 1/35th scale shopping carts. Sorry, my bad. What did you use to prime and paint the cork building? Hi Matt - what?! you've always got a project going on! Mike and Mike - that cart is nice! not cheap tho....wow - believe it or not, in this case, I don't specifically want these fellows to look like the sort of homeless we sometimes see - instead, I'll characterize them a people always on the move - street people of some sort yes, but also able to get the heck outta here if they need too - maybe a fine distinction? even on a not warm day, the one above was emitting a heavy - unpleasant odor...yuck! and traditional manhole covers - it might be too messy to add either at this point, but who knows?? Ok - thanks very much for having a look! As too the manhole cover because of your base material, cutting some circle out of vinyl or super thin plastic would be the way to go. Very unique stuff man. You never cease to amaze. They happen to be woodworking at the moment. amazing work Nick... and I am SURE you will find a way to integrate the manhole cover and rain drain cover. BTW, just for the sake of asking, how big is the base for this dio and just where do you A) build it and 2) store it or display it? Inquiring minds want to know! Nick, the cafe scores another WOW! Very nice. I googled the SF combined sewer system. I did not think anyone did that. Gives the city A LOT of efleuent to treat! Most cities have seperate systems and simply screen the trash out of the storm water run off before discharging it. Seems SF also has huge underground storage tanks to hold the run off during heavy rains to keep the run off from overwhelming the treatment facility. Not sure all that is very wise but the system was set in place 120+ years ago so it is a little late to change now! As to your drawings, I love em! They clearly show what you have planned! Been trying to come up with a cheap source of fan blade structures. So far all I can suggest was that I saw a TV ad for a system of heated hair curlers where each end of the curler looks like a miniature turbine blade assembly. If I spot it again I will get some contact info. For now Best Regards and keep up the great work! The HO scale trains typically have detail sets for the fans, maybe the larger scales do as well??? or use computer fan blades - hit up the work IT guy for surplus equipment. Really outstanding work Nick! Love to see the detail and realism on a subject that is really off the beaten path here. I don't know if you've seen these before, but here are some behind the scene pics of the models being made for Blade Runner. Hi model builders, thanks for taking the time to share some thoughts and comments - as has been the case with this build so far, lots of great ideas! Hi Jerry - the unique is fun, thanks - it is fun looking for ways to invent and solve problems - I really like it. Hi Kobus - thanks for taking some time to drop by and comment - I appreciate it! Ha! Matt I knew it! your shop is never idle! Hi Patrick - good questions I don't use a fancy workbench - as these builds are typically built in many modules - I can set up a base, and leave it in a safe place and then go to town on many little segments/modules using a pretty small space - an old drafting top (the light/not heavy kind) laying across an equally old ottoman - as for storage - I have a work area that once had a model rr - no rr now = some room for dios to call home! Hi Ryan - wow! that's a great idea!! in fact, the layout of that blade is very similar to that used on the HO locomotive fans - Yes! I'm going to try it! Finally - Chris - thanks very much for that link! I've seen a few screen shots, but never that website! very cool! or -- very not cool...as I'll follow it too closely and never finish!!! This might be a bit more clear on what I'm up to. Now that I've built a few things, including many that will never be visible (and, by the way, just as our dear friend Romain used to remind me with delight) - focus on what you can see - not what you can't like "the power cord behind the counter", and so on...well, I've learned to let go of that and put my effort into what contributes to the scene - that's enough work anyway! And that's where it sat this morning - the beige colored figures are form Paracel, and the grey, from Valkary (spelling???). 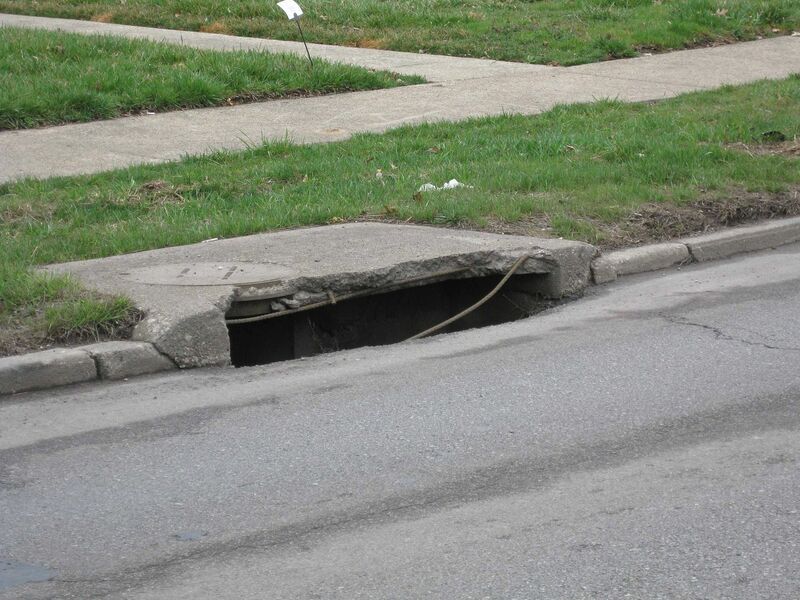 This type of curb box is usually set flush with any sidewalk surface that surrounds it. I think the problem Nick runs into is the base material. Being canvas he can't modify it for the drains. Maybe removing a piece of the concrete gutter, paint the spot black underneath then add a thin styrene/vinyl cut out of the drain top. Might be best to leave it along this time. hi guys -- I'm sorry to say, I'm running today without much time to spare - so, I'll be brief! First, Mike and Jesper, thanks, guys! appreciate the words! Ryan and Mike - you both raise good ideas and points....Ryan, you might be right - i might wreak all sort of havoc by digging deep into the base - that is, i might really screw it up - Mike, though who knows, maybe cut something shallow, and paint it black??? or - try it next time! And there's the sidewalk cafe - getting there!! the boxes on the shelves are made from the left over pieces of resin castings- you know, for tires, figures etc - I think they do the trick! I was getting a bit burned out on this cafe, so for a quick diversion, i took a pass at the "big" fans. The aluminum can idea worked great!! thanks very much! Looks ready made but could be a build up of plastic shapes??? What is the chain link material?